Background: Dental schools are known to be highly demanding and stressful learning environments. Dentistry involves an acquisition of required academic, clinical and interpersonal skills during the course of learning. Practicing dentistry requires clinical skills and patient management skills, which also add to the stress perceived by the students. Identifying sources of stress represents the crucial first step towards advocating policy changes and strategies to alleviate the stressors and enhance students' stress coping skills. The aim of this study was to identify self-reported sources of the stress among the final year [4 th year] dental undergraduate students in a Dental Teaching Institution in Bangalore, India. Materials and Methods: A 38 items, 4-point Likert Scale item modified Dental Environmental Stress (DES) questionnaire, addressing 5 stressor domains (living accommodation, interpersonal relationships, academics, clinical skills and miscellaneous) was administered to all final year undergraduate dental students of the Institution. Items and domains were considered to be perceived as "stressful", when students classified them as 'slightly', 'moderately' or 'severely stressful'. Descriptive and bivariate analyzes based on chi square tests were performed. Results: Out of the 38 items, 19 items were reported to be "stressful" by >70% of the students. Of these, examinations, difficulty in managing difficult cases, lack of patient co-operation, difficulty and amount of course work and completing clinical requirements were reported to be "stressful" by >85% of the students. Personal physical health, difficulty in making friends, staying with roommates, narcotic substance dependencies were least commonly reported to be "stressful". Discussion and Conclusion: The stress provoking factors among >70% of the students are quite similar to those reported by the researchers' worldwide. Curricular changes, student support mechanisms at departmental/institutional level with appropriate policy changes need to be considered to assist the students in coping with identified stressors. There is an evidence from longitudinal studies that, perceived stress corresponds with transitions from entry- to higher-level stages in a dental students' course of studying. In fact, a study conducted in USA identified the higher prevalence of stress among the dental undergraduates in the clinical years compared to those in the non-clinical years. Undergraduate final year [4 th year] dental students in India, take up exams in 7 clinical subjects at the end of final year [Revised Scheme 2: Dental Council of India guidelines]. Final year is often perceived as the toughest year because the students have to cope with an increase in academic and clinical work load. Some common stressors found in the 1 st 3 years of the undergraduate course may have been resolved and some may have become more pronounced. Hence, it is important to identify the potential sources of stress for each undergraduate year in the dental institution, and institute the requisite institutional changes to enhance the stress coping skills of the students in that institution. This study was conducted to assess the perceived sources of the stress among the final year undergraduate dental students in a dental teaching institution at Bangalore. All 44 final year dental undergraduate students participated voluntarily in the study. In October 2010, data was collected in two days in a class room setting by using pen and printed Dental Environment Stress (DES) questionnaire. Absentees on the first day were requested to be present on the second day. The DES questionnaire is a close-ended questionnaire, containing 38 questions pertaining to potential stressor factors like living accommodation, interpersonal relationship, academic performance, clinical skills and miscellaneous factors. This questionnaire has been modified and used in several studies across the world. ,,,,,,,,,,,, Data were also collected with respect to their accommodation and home town. The participants assessed the stressors on a 4-point Likert scale ranked as, 1 Not Stressful, 2 Slightly Stressful, 3 Moderately Stressful, 4 Severely Stressful. Categories of slightly stressful, moderately stressful and severely stressful were combined to obtain the overall percentage of the students who felt certain factors were stressful. An ethical clearance was obtained from the Institutional Review Board. Informed consent was obtained from all the participants in the study. The confidentiality of the study participants was ensured by anonymous submissions. Data were analyzed using SPSS version 10 for descriptive statistics and frequencies. Chi -square tests with a P < 0.05 threshold were used to assess whether the place of accommodation and gender influenced the stress perceived by the students. Out of the 44 final year students, 38 students participated in the study. [response rate: 86%] They were in the age group of 20-23 years with the mean age being 21.2 ± 0.7. Of total, 26.4% (10 students) were male and 73.6% (28 students) were female. 81.5% (N = 31) students reported places other than Bangalore as their home town; of those, 93.5% (N = 29) students were hostelites. The difference in the stress perception between males and females was not statistically significant (P > 0.05). Place of residence had a statistically significant influence on stress. Hostelites experienced more stress compared to those who stayed at home [Table 1]. While calculating proportions of items been considered as "stressful" in a dichotomous manner, the degree of the perceived stress was ignored at this stage. 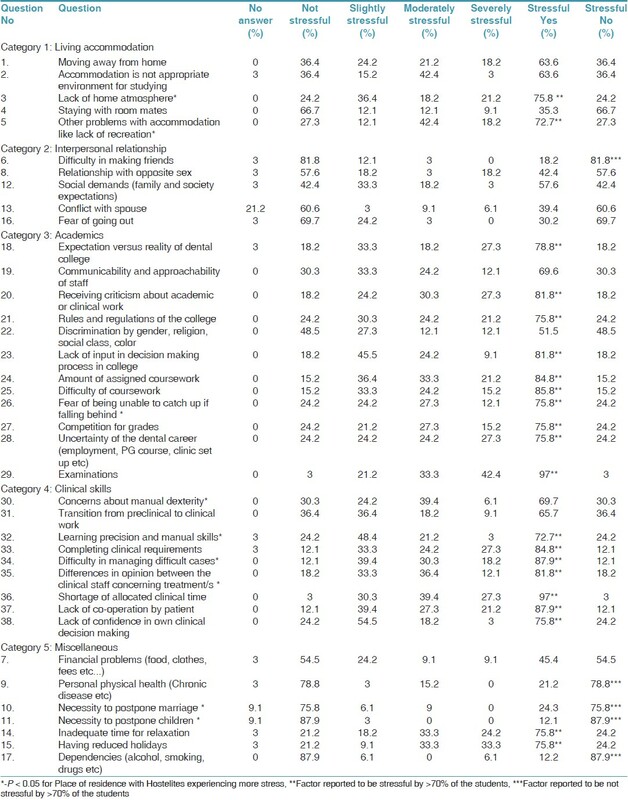 Out of the 38 items, 19 were reported to be "stressful" by >70% of the students [Table 1]. As an example, 85% or more students reported examinations (97%), shortage of allocated clinical time (97%), difficulty in managing difficult cases (88%), lack of patient co-operation (88%), difficulty and amount of course work (86%), and completing clinical requirements (85%) to be "stressful" [Table 1]. Living accommodation was assessed with 5 questions. Lack of home atmosphere was reported to be stressful by 75.8% of the students followed by the lack of recreation (72.7%). Hostelites were significantly more stressed by these factors than those students staying at home (P < 0.04). Staying with roommates was least stressful (66.7%) [Table 2]. Interpersonal relationship was the least stressful of all the categories. Making friends was reported to be non-stressful by 81.8% of the students ,while social demands of family and society expectations was stressful to 57.6% of the students [Table 2]. Among academic concerns (12 questions), 11 queries were reported to be stressful by >70% of the students. Examinations topped the list with 97% of the students reporting it as stressful followed by amount and difficulty of coursework (85% and 86%). Lack of input in decision making and receiving criticism about academic and clinical work (82%) were other stressors frequently reported. Expectation versus reality of the dental college (79%), rules and regulations, competition for grades, fear of catching up if left behind and an uncertainty of the future (76%) were other stressors reported. Communicability and approachability of the staff was reported to be non-stressful by 30.3% of the students. A significant 48.5% of students reported that there was no stress because of racial or gender discrimination [Table 2]. Clinical requirements (9 questions) were reported to be stressful by >70% of the participants. Shortage of allocated clinical time (97%), difficulty in managing difficult cases, lack of co-operation by the patient (88%) were the top 3 stressors in this category. Transition from preclinical to clinical work was reported to be non-stressful by 37% of the students [Table 2]. Among the other factors, having reduced holidays and an inadequate time for relaxation (76%) was stressful, while financial problems, personal physical health, necessity to delay personal milestones like marriage, children, dependencies on alcohol, drugs etc. were reported to be least stressful [Table 2]. This study was conducted to assess the different sources of the stress as perceived by the final year dental undergraduate students in Dental Teaching Institution at Bangalore. The Curriculum being followed is as per the Dental Council of India guidelines. The syllabus and examination scheme is as per the BDS Undergraduate Ordinance of the Rajiv Gandhi University of Health Sciences to which all the dental teaching institutions of Karnataka are affiliated. The clinical quota requirements are as per the individual department specifications, which in turn are dependent on the hospital patient inflow. Undergraduate dental students in the final year are subjected to increased workload, because they have to take up exams in seven clinical subjects at the end of the year (Revised Scheme 2- Dental Council of India Guidelines), while the students in the first three years of the undergraduate program have to appear for 4 exams only. Thus, the stress levels might be high among the final year undergraduate students, a hypothesis, which needs to be further explored. In India, there has been an increase in the number of women taking up dentistry. This has been identified in the present study as well with 73% of the study participants in the final year of under graduation being females. Differences in perceived sources of the stress between male and female students were found to be not statistically significant. This is in an agreement with the findings reported by Bradley et al. and Heath,  but in contrast with a systematic review reported by Alzahem et al. in 2011. Whether this is a true finding or is it due to the sample being predominated by females, needs to be further explored. In this study, all the stressful situations (be it slight, moderate or severe) were clubbed together to obtain a binomial variable regarding the presence or absence of the stress. Even if the "slightly stressful" situations are mainly due to the physiologic reasons, the same cannot be discounted. Stress as perceived by the student, irrespective of the degree of stress, does contribute to the overall stress. Stressors associated with living accommodation were significantly experienced more by those living in hostels, rather than those at home or as paying guests. Stress was mainly due to the lack of recreation and home atmosphere. This suggests that the quality of living in hostels should be improved with adequate facilities for recreation being provided. Mentors and matrons should be appointed to make the students feel at home. Dependencies on alcohol, drugs were reported to be non-stressful by 88% of the students. Necessity to postpone personal milestones like marriage and children was also not stressful, possibly due to the age group of the participants. Interpersonal relationship factors were among the least stress provoking factors suggesting that the interpersonal relationship skills of the students are fairly good. Communicability and approachability of the staff was also less stressful, suggesting that the students find it easier to communicate with the faculty in the Institution. The stress causing factors reported by >85% of the students were mainly related to academic and clinical concerns. Examinations, competition for grades, fear of being unable to catch up, difficulty and amount of course work, an uncertainty of the future employment were reported as being stressful. Since it is impossible to do away with the existing gradation system due to Health University and Dental Council of India guidelines, it is imperative that the stress coping skills of the students be enhanced. Further studies need to be conducted to assess the feasibility and efficacy of these stress coping measures for this cohort, in particular, and for all the dental students, in general. Factors like examinations, amount of work and time available, an uncertainty of the future, academic and clinical concerns were the major stressors among the final year dental undergraduate students of Dental Teaching Institution in Bangalore, while interpersonal relationships, living accommodation and interactions with faculty were the least stressful. The stress experienced by the final year undergraduate students might probably be cohort specific or institution specific, therefore, this study's findings need to be further validated. It is important to understand the dynamics involved in the stress mechanism, to alleviate the identified sources and to enhance the stress coping skills. Curricular changes, student support mechanisms at departmental/institutional level with appropriate policy changes, mentorship programs etc. need to be considered, to assist the students in coping with identified stressors and to make learning a joyful rather than a laborious process. The authors thank all the final year dental undergraduates of D A P M R V DC for having participated in this research. 1. Divaris K, Barlow PJ, Chendea SA, Cheong WS, Dounis A, Dragan IF, et al. The academic environment: The students' perspective. Eur J Dent Educ 2008;12 Suppl 1:120-30. 2. Polychronopoulou A, Divaris K. Perceived sources of stress among Greek dental students. J Dent Educ 2005;69:687-92. 3. Rajab LD. Perceived sources of stress among dental students at the University of Jordan. J Dent Educ 2001;65:232-41. 4. Heath JR, Macfarlane TV, Umar MS. Perceived sources of stress in dental students. Dent Update 1999;26:94-8. 5. Hinshaw KJ, Richter LT, Kramer GA. Stress, Burnout, and Renewal Activities of Dental Hygiene Education Administrators in Six U.S. Midwestern States. J Dent Educ 2010;74:235-50. 6. Naidu RS, Adams JS, Simeon D, Persad S. Sources of stress and psychological disturbance among dental students in the West Indies. J Dent Educ 2002;66:1021-30. 7. Sanders AE, Lushington K. Sources of stress for Australian dental students. J Dent Educ 1999;63:688-97. 8. Muirhead V, Locker D. Canadian dental students' perceptions of stress. J Can Dent Assoc 2007;73:323. 9. Humphris G, Blinkhorn A, Freeman R, Gorter R, Hoad-Reddick G, Murtomaa H, et al. Psychological stress in undergraduate dental students: Baseline results from seven European dental schools. Eur J Dent Educ 2002;6:22-9. 10. Muirhead V, Locker D. Canadian dental students' perceptions of stress and social support. Eur J Dent Educ 2008;12:144-8. 11. Sugiura G, Shinada K, Kawaguchi Y. Psychological well-being and perceptions of stress amongst Japanese dental students. Eur J Dent Educ 2005;9:17-25. 12. Alzahem AM, van der Molen HT, Alaujan AH, Schmidt HG, Zamakhshary MH. Stress among dental students: A systematic review. Eur J Dent Educ 2011;15:8-18. 13. Yap AU, Bhole S, Teo CS. A cross-cultural comparison of perceived sources of stress in the dental school environment. J Dent Educ 1996;60:459-64. 14. Kumar S, Dagli RJ, Mathur A, Jain M, Prabu D, Kulkarni S. Perceived sources of stress amongst Indian dental students. Eur J Dent Educ 2009;13:39-45. 15. Acharya S. Factors affecting stress among Indian dental students. J Dent Educ 2003;67:1140-8. 16. Polychronopoulou A, Divaris K. A longitudinal study of Greek dental students' perceived sources of stress. J Dent Educ 2010;74:524-30. 18. Garbee WH Jr, Zucker SB, Selby GR. Perceived sources of stress among dental students. J Am Dent Assoc 1980;100:853-7. 19. Sofola OO, Jeboda SO. Perceived sources of stress in Nigerian Dental Students. Eur J Dent Educ 2006;10:20-3. 20. Tandon S. Challenges to the Oral Health Workforce in India. J Dent Educ 2004;68:28-33. 21. Bradely IF, Clark DC, Eisner JE, De Gruchy K, Singer DL, Hinkleman K, et al. The student survey of problems in the academic environment in Canadian dental faculties. J Dent Educ 1993;57:225-31. 22. Bagdi, A Too young to be stressed. Childhood Education 2004;80. Online accession number 116223367.